We started today off with another power walk along the bike path that passes through our campground, about 6 km all together. I’ve been listening to photography podcasts on my iPhone as we walk along and can get through one show while we walk. Scott Bourne’s Photofocus and Rick Sammon’s Digital Photo Experience are popular choices and an easy listen while walking or running. Following our workout, we picked up Sarah and headed to Beaumont to see our puppy, Teddy. We spent another enjoyable hour watching the nine puppies feeding, sleeping and even peeing! Teddy spent lots of time outside the wooden box housing the puppies. He found the linoleum floor a little tricky to walk upon but was very playful, often chasing our feet and toes or hands and fingers as we tapped on the floor. 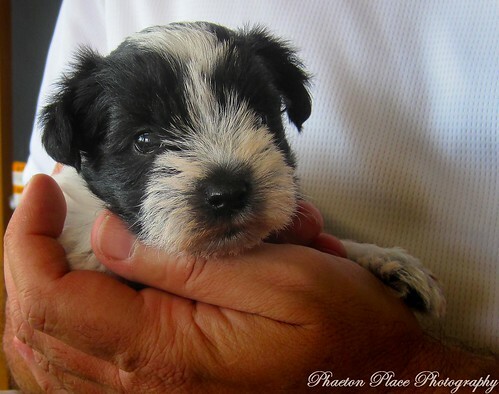 He is certainly a little bundle of energy and he likes his grub too! You can see the puppies enjoying a lunch of ground turkey and a special skim milk powder for puppies in the above photo. 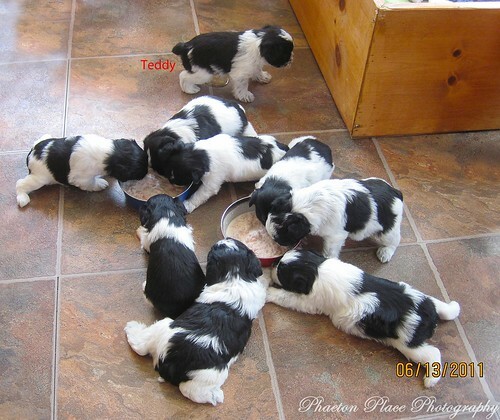 All the puppies that is……except Teddy! Look closely to see what Teddy is doing. We grabbed a quick lunch at Tim Hortons and then headed into South Edmonton for a bit of shopping. I managed to pick up a silicone shell for my iPad 2 at Best Buy that works well with the Apple Smart Cover and is perfect for my needs. We also picked up some groceries at Planet Organic before stopping at Ikea on the way back to Leduc. Tuna melts with salad for supper followed by a little TV. It wasn’t looking too good for the Canucks after the first period in Boston though. The puppies are soooo cute!! Teddy is just adorable! You know a fellows got to do what a fellows got to do.